Community Service is an organised individual or group activity, that serves the community, is not funded and it is pedagogicaly prossesed according to the law, in eight areas. Hungarian law of education (2011. évi CXC. Törvény 6.§ (4)) sets as requirement for starting the final exams the fulfilment of 50 hours of community service for all students. 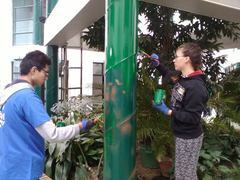 To start Community Service, at the beginning of the year the student must fill in application form, and parent approval. These documents are in Hungarian, and the coordinator provides any help needed to fill them. 1: How and where to do? In case a student/parent finds an attractive opportunity by her/him self and fits in the law regulations (organization), the school gladly helps the student to fulfil the hours at the institution chosen. Also parents are asked to motivate their child to fulfil the hours before the last year of school, until they finish 11th grade. Apart from the experience of helping, the aim of community service is to make young people do good thing for others, the community, environment, but at the same time enjoy it and find it meaningful. 1.1.1 Community service can count if the service is done in Hungary, at an organization with Hungarian residence. Environmental: environmental organizations, Animal shelters, WWF, National Geographic etc. Social and charity: charity organizations, homeless, elderly caring, mentally disabled, people with other disabilities care. Disaster recovery: fire department, police, city/tourist police, in occasions of flood for example at the coordinator organization of the helping team. At the organizations cooperating with the police in accidents and crime prevention: (e.g. translating etc). 1.1.3 When student is doing service outside school, the school needs to have a cooperation contract with the organization. To make a contract the procedure is the following. There is a form at the Hungarian Education Ministry homepage which the school alters according to the organization we are approaching. The data needed are the name of the organization, address and also the name of contact person in charge, email and telephone). With this information the school approaches the organization write a contract, send it to them and then both persons in charge need to sign the papers. 1.2 In the school or at events organised by the school. All hours signed during one semester are signed in the official documents of the student, the report card and certificate. If the student leaves the school the school provides a certificate of the hours completed until that time. During school days the maximum hours that can be given are 3. During days of no school (weekends, summer or any other brake) the maximum hours that can be given for one day are 5. 4. Upcoming events are posted to the facebook page of school prior to the event.